With its bitterly cold climate and high altitude, Qinghai province isn’t the ideal location for growing lush vegetables or tropical fruits! However, it’s the perfect place for growing barley and raising yaks, both of which thrive on its rugged terrain. 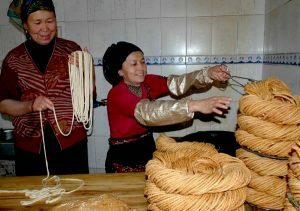 Thus many of the local snacks in Qinghai contain wheat flour and yak-based products, such as yak’s milk or yak butter. 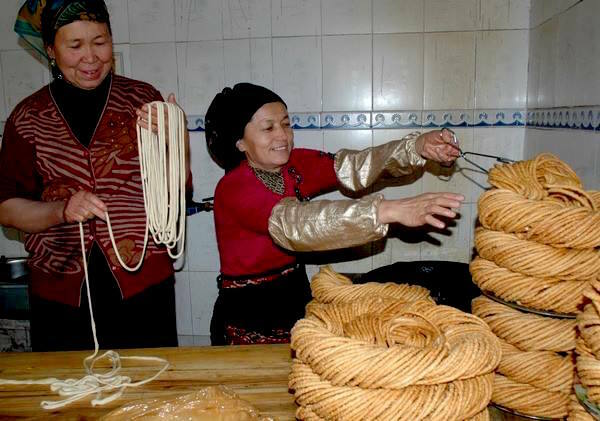 The large constituencies of Hui Muslim and Tibetan people that occupy Qinghai also imbue many of its signature snacks with a delightful ethnic flair. So be prepared for food that’s simple, full-bodied, and full of heart! Liangfen is arguably the most famous and popular street snack in Qinghai province. It’s normally sold from small vendors or market stalls and is served cold, so it’s the perfect treat to help you cool down during the summer months! 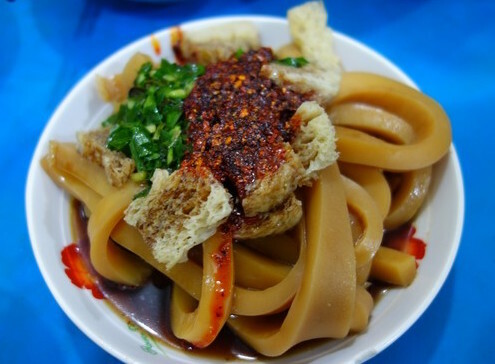 Although it looks a lot like a noodle dish, the “noodles” are actually finely cut strips of mung bean or pea jelly. These are topped with a sumptuously aromatic blend of vinegar, mashed garlic, crushed mustard seeds, and chilli flakes. Some vendors also add ground peanuts and sesame seeds to the mix in order to give the slippery “noodles” a nutty crunch. With yaks being so prolific in the region, yak milk, yak yoghurt, and yak butter are everyday staples for locals in Qinghai province. While yak butter is typically used for cooking or making tea, Yak Milk Yoghurt is a smooth treat that’s eaten straight from the bowl! You’ll be able to spot this type of yoghurt immediately thanks to the unique yellow sheen that forms on its top. 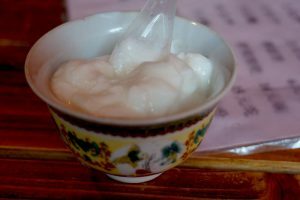 The creamy texture and slightly sour tang of the yak’s milk gives it a flavour that is delightfully distinct from cow’s milk yoghurt. It can be eaten as is, although some people prefer to sprinkle a teaspoon of sugar on top first to sweeten the deal! This popular street snack is traditionally a festival food of both the Hui Muslims and the Salar Muslims. To make Sanzi, you first mix wheat flour with vegetable oil and crushed Sichuan peppercorns. This is kneaded into dough and then gently pulled into long, thin noodles. Deep-frying the noodles requires the most skill, as they must be a crisp golden brown before being removed from the hot oil. Take them out too early, and they’ll be undercooked; leave them in for too long, and you’ll be faced with a burnt mess! The snack itself is neither salty nor sweet, but is celebrated for its satisfyingly crispy crunch. 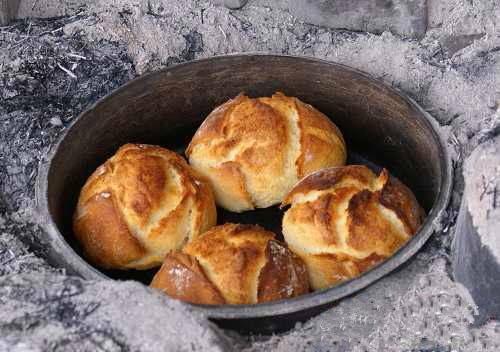 Cooking Pot Bread is so-named because its distinctive shape and pattern depends on the pot in which it was baked. To begin, wheat flour dough is rolled up with oil and turmeric, which is what gives this fluffy bread its characteristically yellow tinge. The dough is then placed layer by layer into a deep cooking pot or tin and is baked until it turns a soft golden brown. Finally, sesame seeds or caraway seeds are sprinkled on top of the finished bread to give it an extra touch of flavour. The result is a light, slightly crisp loaf that is perfect for eating with meat, soup, or noodles.